The children may wear green fleeces with the school logo during playtimes, outdoor PE and visits off site. We plan to update our school uniform policy very soon to include the wearing of grey or black plain socks for boys, and grey/white plain socks or grey plain tights for girls. 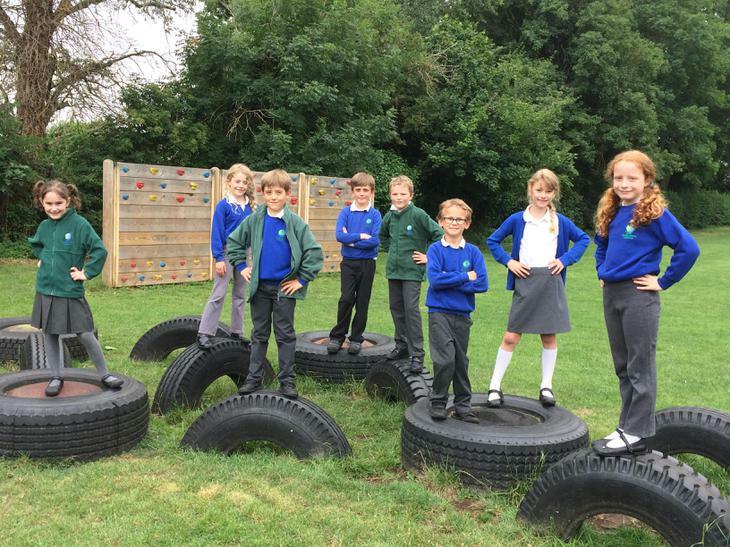 We ask that children wear black shoes that are comfortable and suitable for school. Polo shirts, sweatshirts and cardigans with the school logo are available to order from School Trends. https://www.schooltrends.co.uk/uniform/MeridianPrimarySchoolCB237DD. The PTA also have regular second hand uniform sales, please look out for the dates on the calendar and the PTA pages. If you would like more information about the school uniform, please ask at the office. The wearing of jewellery, except stud earrings, by any child is not allowed in the interest of safety. The school will not accept responsibility for any jewellery that is lost or stolen. Children who have pierced ears are requested to wear stud earrings and these must be removed during a PE lesson. We ask that children do not have dyed, bleached or inappropriate hairstyles for school. It is important that children have a change of clothes for PE and the following basic kit is recommended: royal blue shorts, a T-shirt in their house colour – red, blue, green or yellow, as appropriate, trainers/pumps. Children should bring a named PE bag (e.g. drawstring bag) to hold their PE kit. For outdoor games the children may also wish to wear trainers and tracksuits/ green fleeces during cold weather (no hoodies). Please name all clothing including coats, shoes and PE clothing. The school cannot be held responsible for personal items that are lost or stolen within school. There are no special changing facilities in school so pupils change in the classroom where they are supervised by a member of staff. With older children, boys and girls change in a separate area.